"Rest assured his little life has now changed for the better and he will receive all the care and affection he deserves." Another elderly and ailing cat who earlier had been cruelly abandoned has been unjustly arrested, incarcerated, and summarily executed and, tant pis, the perpetrators of this shocking crime are not to be found anywhere amongst the ranks of the usual suspects. Rather, they belong to none other than the charity Cats Protection which masquerades throughout the United Kingdom and Northern Ireland as the savior the species. This time around the victim was an eleven-year-old brown and white tom named Alfie from Stevenage, a town of roughly eighty-five-thousand inhabitants located fifty kilometers north of central London in Hertfordshire, whose downward spiral into that bottomless abyss from which no cat ever returns began at 7:35 p.m. on September 26th when he was spotted taking a breather on a doorstep in Mackenzie Square by twenty-five-year-old Gemma Brown while she was out canvassing door-to-door for the Stevenage Borough Council. His face was such a mess that au premier coup d'oeil she did not know quite what to think. "It was really dark and initially I thought he had been attacked by a dog, but having a closer look it seemed like cigarette burns," she related to The Comet of Stevenage two days later on September 28th. (See "Hunt to Find Owner after Badly Injured Cat -- Covered in Suspected Cigarette Burns -- Is Found on Stevenage Doorstep.") "One of his eyes (the right one) was completely red and his nose was really swollen around two cigarette burns. His hair was all matted and he smelt bad." In addition to the horrific injuries to his face, he apparently also was on the point of starvation. It therefore is not surprising that between his injuries and a lack of sustenance that he either was unable or had lost all interest in grooming himself. Given that any halfway healthy cat is the very epitome of cleanliness, any one with matted fur and a discernible body odor is a cause for grave concern. To her credit, Brown immediately recognized the danger signs and wasted no time in taking action. She first telephoned her mother, Carmen, who readily agreed to come and stay with Alfie while she returned home for a cage. While she was away, he not only conclusively demonstrated his domesticity but his trusting and forgiving nature as well by waiting patiently with the older woman until Brown returned. She then transported him to Great Ashby Veterinary Hospital on Whitehorse Lane whereby she immediately turned around and undid all the good that she had done by relinquishing custody of him to the knackers. That colossal and totally unforgivable mistake on her part spelled the end for Alfie. "I am hoping that the cat is okay and makes a full recovery and is put in a decent home," she added to The Comet. 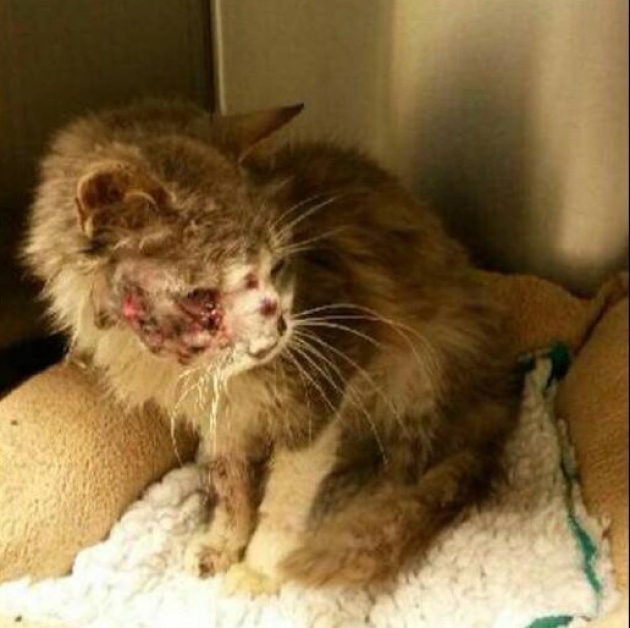 "Whoever did this should be caught and face justice because it is disgusting." Hope and vengeance are worth considerably less than nothing under most circumstances but that is especially the case after an ailing and defenseless cat has been thrown to the wolves. If she had cared so much as one whit about Alfie she would have retained custody of him, paid for his treatment out of her own pocket and, above all, demanded in no uncertain terms that the veterinarians kept him alive at all costs. What exactly the practitioners did for him is shrouded in secrecy. The Comet, for instance, at first reported that they were unable to pry open his mouth and that in return necessitated that he had to be anesthetized before they could examine him. The newspaper later reversed itself by claiming that Alfie was not well enough to be properly examined and that as a result the veterinarians were unable to substantiate that the injuries to his face had been inflicted by a burning cigarette. It was at this juncture that either Brown or, more likely, Great Ashby contacted the North Hertfordshire Branch of Cats Protection. That petit fait alone gives the game away because the only conceivable reason that either party had for doing so was of a monetary nature. C'est-à-dire, neither Brown nor Great Ashby were willing to pay for Alfie's treatment. The charity's Bianca Kubler then sprinted into the breach where she wasted no time in pulling the wool over the eyes of the unsuspecting citizens of Stevenage. "A big thank you to the public for all the interest shown in Alfie's plight," she blowed to The Comet on October 1st. (See "Future of Neglected Cat -- Found in Terrible Condition in Stevenage -- Looking Much Brighter Thanks to Good Samaritans.") "Rest assured his little life has now changed for the better and he will receive all the care and affection he deserves." Against all odds, it initially looked as if Cats Protection had mended its evil ways and for once was actually operating on the level. "Alfie had three suppers on Tuesday night (September 29th) and his face has been gently cleaned," she added to The Comet on October 1st. "He seems happy to be snuggled up in his soft, warm bed with a full tummy." Almost as soon as those words had escaped from her lying lips Kubler had a change of heart and instructed the mercenaries at Great Ashby to whack him. "Sadly he had bone cancer most probably," she told The Comet on October 2nd. 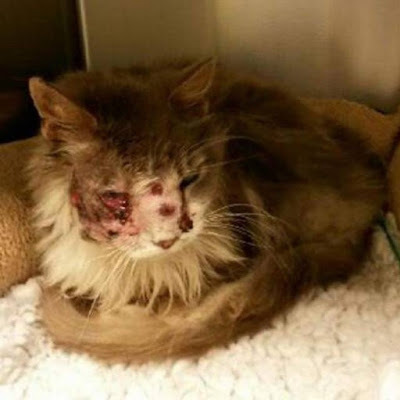 (See "Badly Neglected Cat Found on Stevenage Doorstep Put Down after Vets Discover Incurable Cancer.") "We took him on because it was going to be quite costly to treat him but there was nothing that could be done for him." First of all, it is extremely odd that she would allege that he "most probably" had bone cancer. That is especially the case in that such a determination is usually only arrived at following a thorough physical examination that is accompanied by a litany of diagnostic tests that often include a complete blood count, a biochemistry profile, urinalysis, x-rays, and computated tomography, nuclear bone, and radiographic scans. The most reliable indicator, however, is a biopsy. Since neither Cats Protection nor Great Ashby have revealed if any of those diagnostic tools were utilized, it is difficult to understand how that Kubler could have arrived at the non sequitur "that nothing could be done for him" without first knowing what exactly ailed him. As a consequence, the abscesses on Alfie's face could have been the result of almost anything, including a beating with some type of object. Also, Brown's original concerns about either a dog or a cretin wielding a lighted cigarette cannot be completely ruled out of the equation. At the very least, he could have been made comfortable with painkillers, antibiotics, and topical analgesics and then placed in a secure and loving home where he would have been provided with plenty to eat. The mere fact that he was able to scarf down "three suppers" is proof that he still had both a hearty appetite and the will to live. It is even possible that between a warm, stress-free home, a proper diet, and the appropriate treatment that he might have lived for an extended period of time. Even though nothing ever could have made up for the horrors and deprivations that he had been subjected to while living on the mean streets of Stevenage, Cats Protection owed him not only the chance, no matter how slim, to go on living but to at the very least spend his last days in a loving home. Like Brown and Ashby before it, Cats Protection ultimately proved to be too cheap and heartless to do even that much for him. Instead, it had him rubbed out in his tiny prison cell and afterwards his corpse likely was tossed into the trash just as if he were nothing more than an old piece of meat. Even more deplorably, this is by no means the first time in recent memory that Cats Protection has abruptly killed off a cat after publicly pledging to treat it. For example on July 6th of last year, it whacked a fifteen-year-old ginger-colored tom named Tigger under strikingly similar circumstances. Tigger, who was born in Sydney in 1999, mysteriously turned up in London in 2004. He then disappeared from the radar screen until June 7th of last year when an unidentified woman residing in Laurelvale, fifty-six kilometers south of Belfast, telephoned the Armagh Branch of Cats Protection in order to report him for loitering in her precious little garden. The charity came and collected him and took him to the Willow Veterinary Clinic in Portatown, thirty-seven kilometers southwest of Belfast, where he initially was diagnosed to be malnourished but otherwise as fit as a fiddle. Just as history was destined to repeat itself a few months later, Cats Protection promptly pledged not only to care for him but to reunite him with his original owners. Less than two weeks later the organization was talking and behaving just like PETA. "Sadly his health has deteriorated and he is in kidney failure," an unidentified spokesperson for the Armagh Branch told the Daily Mail on July 1st. (See "Globetrotting Aussie Cat Found in Ireland (sic) Is Spending His Last Days in a Cat Shelter after Being Diagnosed with Kidney Failure.") "He is spending his last days with us and when his time comes it will end in dignity surrounded by love." Cats Protection never will come clean but it nevertheless is strongly suspected that it killed both Alfie and Tigger because their owners had refused not only to pay for their treatment but to care for them during their convalescence. The only other explanation that makes sense is that the conditions and quality of care provided at its shelters in Stevenage and Armagh must be lethal to cats. In addition to Brown, Great Ashby, and Cats Protection, the laundry list of villains who played crucial roles in Alfie's demise also includes his former owner. It was, after all, that individual who set the wheels in motion that ultimately led to his death by dying without making any provisions whatsoever for his continued care. Sometimes tragic dénouements of that sort cannot be helped, such as when an owner dies suddenly. At other times, cats are saddled with owners who are all alone in this world themselves and therefore have no one to turn to whenever they become ill. Nevertheless, extenuating circumstances of that sort are of cold comfort to a cat who has been left behind to fend for himself. Although there is absolutely nothing in the public record to support such an accusation, it nonetheless is remotely conceivable that Alfie could have been abandoned after he became ill and therefore long before his guardian died. As reprehensible as that sounds, it is suspected that was precisely what happened to Victoria. 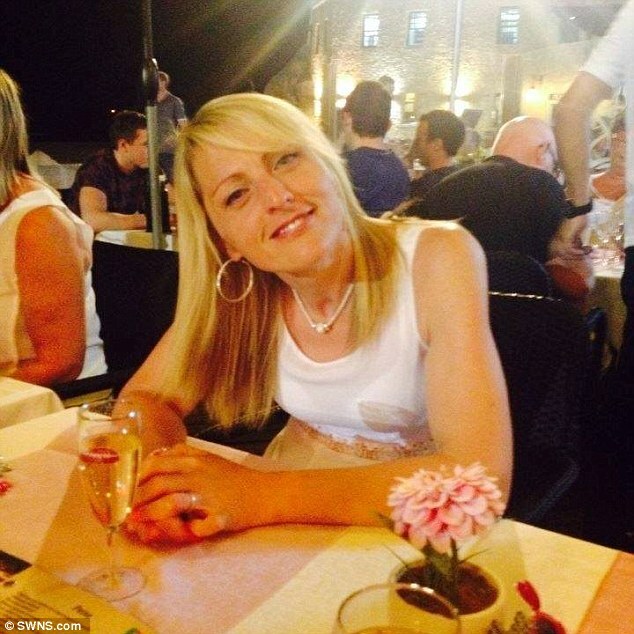 The negligence of Alfie's guardian was compounded by the despicable callousness of that individual's relatives who never wanted any part of him. In fact, they were so unwilling to foot the bill for his treatment that they signed over custody of him to Cats Protection almost as soon as they were identified and contacted. They additionally cannot claim that they were ignorant of his plight in that he was a well-known figure in and around Mackenzie Square. "I posted a picture of the cat on Facebook to try and find the owner and loads of people have been commenting saying that they've seen it being abused for a long time, but why am I the first person to report it?" Brown complained to The Comet in the September 28th article cited supra. That testimony also casts further doubt on the nature and origin of the bruises on Alfie's face. The one thing that is not in dispute is that he was on the street for quite a while and in bad shape to boot while both the relatives of the deceased and the general public turned blind eyes to his interminable suffering. In spite of all of that, Cats Protection has bent over backwards in order to defend the derelict and heartless relatives. "The family of the deceased were with him at the end and are upset about it all," Kubler caroled to The Comet on October 2nd. It is almost superfluous to point it out but of all of Cats Protection's myriad of outrageous lies that one is the most unbelievable. More to the point, their presence at the time of his execution is beside the point; au contraire, the key question that cries out for an answer is where were they while he was languishing on the street? Inexplicably, none of them were charged with either abandonment or neglect. Plus, Cats Protection was so obliging as to even shield them from public censure by categorically refusing to divulge their identities. Furthermore, since neither the origin nor the nature of the wounds to Alfie's face ever was established beyond a reasonable doubt, they additionally could have been charged with abuse at well. Besides Brown's testimony, Angela Sapsford from parts unknown is of the opinion that Alfie had been abused. "Absolutely disgusting," she told The Comet in the October 1st article cited supra. "I hope the culprit gets prosecuted." The RSPCA echoed those sentiments. "This sounds like an extremely upsetting incident and a (sic) horrific attack on a defenseless animal," a spokesman for that agency told The Comet on September 28th. Rather than looking into the matter, the organization as per usual contented itself with issuing an appeal to the public to do its job for it. The chain of tragic events that befell Alfie is something that he shares in common with tens of thousands of cats who are cruelly left to fend for themselves in a hostile world whenever their guardians die intestate. Whereas responsibility for their continued care and well-being should fall by default to the relatives of their deceased owners, not too many of them are compassionate enough in order to undertake such a solemn responsibility. In recent memory, only fifty-six-year-old Beverley Hume of the Kingston Park section of Newcastle-upon-Tyne has been known to buck that depressing trend. That occurred in 2001 when she graciously took in a fifteen-year-old, one-eyed cat named Ginger following the death of her parents. Some institutions are likewise every bit as uncaring as the relatives of Alfie's deceased owner. For example, when San Francisco radiologist Larry Johnson died at age sixty-eight in July of 2007 he left his $6.5 million estate and his cat, Princess, to his alma mater, Juanita College in Huntington, Pennsylvania. Other than being taken in by either relatives or neighbors, the options open to such cats are few in number. Regrettably, many of them die of starvation after they become trapped inside apartments and houses with their deceased owners. The vast majority of cats left behind by their deceased owners do not find new homes but rather are systematically liquidated by shelters and Animal Control officers. Given that utterly deplorable reality, those who wind up on the street like Alfie are actually the fortunate ones. Try as one may, it is utterly impossible not only to find any knights in shining armor in this story but even any good guys in white hats. Au contraire, the entire dramatis personae is deserving of both a good public thrashing and ten years' worth of hard labor in a penal institution. Perhaps that would succeed in sweating some of the lies, arrogance, and downright evil out of their worthless hides. In the case of Cats Protection, its pattern of lies and broken promises have robbed it of whatever credibility it once may have enjoyed. Most damning of all, its publicly acknowledged liquidations of Alfie and Tigger are a strong indication that it also surely must be systematically killing off countless other cats on the sly each year. The only foolproof means of putting an end to these senseless killings is to divest shelters, veterinarians, and everyone else involved of the right to kill cats under any circumstances. Until when, and if, that day dawns the only rights that they will have are those that are bestowed upon them by their owners and the managers of TNR colonies but, as the horrific murders of Alfie and Tigger have more than amply demonstrated, those are not anywhere nearly sufficient. Contrary to what Cats Protection earnestly believes and practices, the lives of all cats matter and this world is a far poorer place with Alfie and Tigger now gone. The injustice of the matter is equally insufferable in that those who neglected, abused, and killed the both of them not only never have been punished for their despicable crimes but remain above ground to continue preening, strutting, lying and, above all, perpetrating additional atrocities against the species. "At first I thought it was a screwed up ball of brown parcel tape that had been blown onto my front step. It was only when I got closer I realized it was a cat." The improvisation of concrete overcoats in order to weigh down the bodies of their victims before tossing them into rivers is a tactic long associated with mafia hit men but in the Withywood district of Bristol it certainly looks as if a still at large cretin fitted a ginger-colored tom of unspecified age named Grant with one back on November 19th. His assailant deviated from strict gangland rub out protocol, however, by doing the fitting while he was still very much alive. Consequently, Grant was left to wander the streets of Withywood in the cold and rain as the wet concrete rapidly hardened into a funeral shroud. It is far from clear how that he managed to get there, but fortunately for him he somehow ended up on the doorstep of thirty-nine-year-old Faye Richards. Even she, however, could barely believe what she was seeing once she had opened her front door. "At first I thought it was a screwed up ball of brown parcel tape that had been blown onto my front step," she told The Plymouth Herald on November 22nd. (See "Woman Mistakes Cat Covered in Concrete on Her Doorstep for a Parcel.") "It was only when I got closer I realized it was a cat." The medical receptionist, who has three cats of her own, can be forgiven for her original mistake in that Grant was so slathered in concrete as to be hardly recognizable. In particular, the concrete on his back already had begun to set but that which covered his stomach was still very much wet. Worst yet, the substance not only was smeared all over his face but some of it even had worked its way into his eyes which by that time were partially closed. "He couldn't even move. He was crying a lot and shivering," Richards added to The Plymouth Herald. "He was really cold." Whereas many individuals would have either turned away in revulsion or shooed him off of their properties, Richards did not hesitate to do all that she could for him. "Most cats if you tried to pick them up wouldn't let you but I was able to pick him up and cuddle him even though I'd never seen him in my life," she related to The Plymouth Herald. 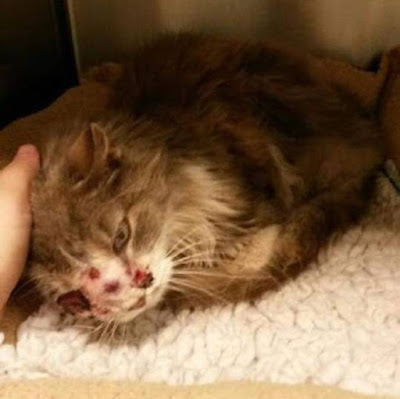 Her compassion did not end there however but it extended to transporting him to The Vet in Hengrove, a nearby suburb, where the concrete had to be brushed out of his fur and flushed from his eyes. 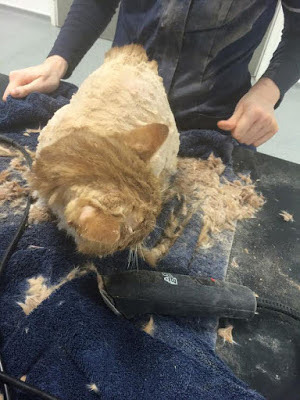 Unfortunately since most of it already had hardened, it was necessary to divest him of the vast majority of his fur. "It was quite sad to see him in that state," the surgery's Emily Slater told The Plymouth Herald. "But after having a hair cut we could see he was relieved. He seems to be doing fine." The attending veterinarian originally was concerned that he might possibly have sustained damage to his lungs as the result of having inhaled dust and fumes from the concrete but those fears apparently turned out to be unfounded. Given that more than two months have passed since he was shaven, his fur likely has largely grown back by now and as a result he once again should pretty much resemble his old self. Despite all the notoriety that his case has generated, no one so far has come forward in order to reclaim him. As of January 14th, he therefore was still residing with one of the practitioners at The Vet where he is said to be "enjoying life to the fullest." It remains to be determined, however, if he is going to be allowed to remain there on a permanent basis or will be put up for adoption at a later date. As to how he got into such a predicament, there are at least two possible explanations. If it was accidental, it would stand to reason that he likely either fell from a height or was chased into the wet concrete by either a dog or a human. He certainly did not mistake the deadly muck for a flower garden and therefore voluntarily choose to wallow in it. Besides, outdoor construction sites that use concrete normally are cordoned off regardless of whether they are located on public or private property. Considering that he was covered from head to tail in the substance, the most plausible explanation is that he was deliberately dunked in it in either someone's house or backyard and then left to die a long and excruciatingly painful death as it hardened. "I felt really sorry for him and shocked," Richards told The Plymouth Herald. "I don't know if it was deliberate or not but I can't think of anywhere round (sic) here where there is cement (sic) for him to fall into. You would hate to think of someone doing this intentionally but you do hear of it happening." 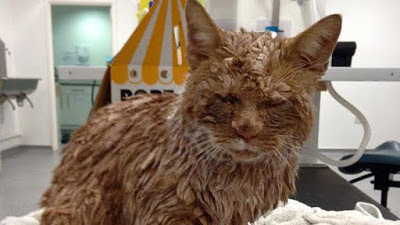 In addition to those substances, cats routinely are doused with paint and hot oil, scalded with hot water, and burned with cigarettes. It accordingly would not be surprising if wet concrete now has been added to that ever-growing list of hazardous substances to be used against them. As best it could be determined, neither the RSPCA, the gendarmes, nor any other animal protection group has even bothered to look into what happened to Grant. Given that he could barely either see or walk, it is almost a sure bet that the attack occurred in close proximity to Richards' house and that in itself narrows down considerably the job of the authorities, that is, if they somehow could be prevailed upon to act. Specifically, any public construction projects using concrete would have been in plain view at the time of the attack and even some private ones would have been visible in driveways and across garden fences. Searches conducted inside private dwellings, however, would have likely required probable cause and prior judicial approval. Although it never was disclosed as to whether Grant had an owner or was homeless, his friendly demeanor toward Richards and the veterinarians strongly suggests that the former was the case. In either event, it is likely that at least some residents of the neighborhood had previously seen him out and about and as a consequence knew something about him. That therefore makes it totally inexcusable that the RSPCA and the police did not canvass the neighborhood door-to-door with photographs of Grant. Although he was neither microchipped nor sterilized, it nevertheless would have been worthwhile to have touched bases with other nearby surgeries. In hindsight, this was a preeminently solvable case if only the authorities had not been quite so derelict in fulfilling their responsibilities under the anti-cruelty statutes. Above all, whoever dunked Grant in concrete should not be allowed to go unpunished. Thanks to the compassion shown him by Richards and The Vet, Grant was able to pull through this terrifying attempt upon his life but the next feline to be dunked in concrete may not be nearly as fortunate. There is a monster on the prowl in Withywood and he needs to be apprehended and jailed before another cat is made to suffer at his hands. Photos: The Plymouth Herald and SWNS (Grant) and the Daily Mail and SWNS (Richards).